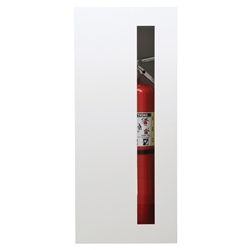 The Vanguard series of architectural fire extinguisher cabinets distinguishes itself with an exceptionally refined look that's realized by concealing all handles and hinges. Depending upon door style, glazing and other options chosen, a Vanguard cabinet can be designed to effortlessly blend into its surrounding environment or be unmistakably conspicuous. BABCOCK-DAVIS warrants all Fire Extinguisher Cabinets to be free from manufacturing defects in materials, factory finishes, and workmanship for a period of five (5) years from the date of shipment. Should a product fail to function in normal use within this period, Babcock-Davis shall furnish a replacement or new part at Babcock-Davis’ discretion. Failure to use product in methods consistent with Babcock-Davis product manuals shall relieve Babcock-Davis of any liability. Our liability under this warranty excludes installation or removal costs involved in the product replacement and excludes any responsibility for incidental or consequential damage of any nature.